Surgeons rewired the nerves in a paralyzed man's arm to help him regain grasping function in his hands. A quadriplegic man has regained partial control of his hands after doctors rewired the nerves in his arm. The 71-year-old patient suffered a spinal cord injury after a car accident four years ago that left him partially paralyzed. Although he was still able to move his arms to a degree, the accident left him unable to pinch or grip with either hand, due to the specific location of his injury. Surgeons at the Washington University School of Medicine performed a bypass procedure, which rerouted one of the healthy nerves that allowed him to flex his elbows and connected it to nerves that control his hand. After eight months of intensive physical therapy, the rewired pathways have enabled him to flex his index fingers and thumbs. Although the patient will likely never regain full utility of his hand, he is now able to feed himself and is close to being able to write again. The case report was published in the Journal of Neurosurgery (you can read the full article here). The rewiring procedure is akin to bypassing a blown electrical circuit. At first, it seems odd that a neck injury that leads to spinal cord damage would allow the upper arms to function but not the hands. But it all has to do with the particular type of injury and the origin of the nerves that control the various muscles in the body. Because his injury caused a disconnect from his brain to the C7 nerves, doctors opted to connect the anterior interosseous nerves controlling the muscles in his hands to the brachialis nerves that control the elbow, which extends from the healthy C6 segment of the spinal cord. 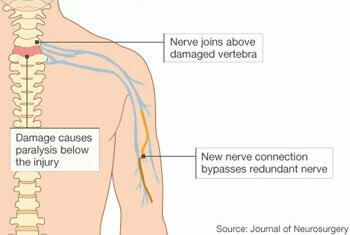 This nerve is considered to be redundant because another nerve performs the same function. Fortunately, this meant the surgeons could operate on his arms and didn’t need to perform a riskier spinal cord surgery. As a general procedure, this type of nerve transfer would only help a very limited number of people who have similar C6/C7 spinal cord injuries at the base of the neck (for more information about the nerve rewiring procedure itself, patients can check out Washington University’s FAQ page). This novel nerve rewiring technique falls under a larger, but highly specialized medical field called restorative neurology, which includes a number of approaches. Some patients who have experienced paralysis due to nerve damage have undergone nerve transplants in which the damaged nerve is removed and replaced with a nerve taken from a cadaver or living person. The downside is the patient must take immunosuppressants for years after. Other medical researchers are exploring reconstructive and restorative neurology, searching for new approaches to help paralyzed patients regain some function of their limbs. Although the rewired nerves in this case report are getting all the attention, it’s equally fascinating that the brain can be reprogrammed in how it processes signals and communicates with the hardwired hand muscles. That functional reorganization in the brain is possible even in an elderly patient speaks volumes about how malleable the brain is. Ultimately, the most promising technology for repairing nerve damage will likely be stem cells. But until the time when stem cell therapies are safe, effective, and readily available, these surgical techniques can help restore partial function to some of the quarter of a million Americans living with a spinal cord injury. Furthermore, nerve rewiring serves as a proof of concept and demonstrates that similar types of nerve transfers could be possible. In all likelihood, some combination of stem cells and rewiring could be standard therapy down the road. A cybernetic arm would require both technological and medical hurdles to become a reality, but rewiring the nervous system will clearly be required. But why stop there? If the brachialis nerve truly is redundant, could something else be attached to it and the brain taught to control it, perhaps something like a switch that could communicate with a smartphone? It may seem like a stretch now, but it doesn’t seem nearly as phenomenal as a paralyzed woman who learned to control a robotic arm with her thoughts. Others are exploring ways to augment their arms either by embedding magnets to hold their iPods or using Skinput, which translates gestures and taps on your arm into computer commands. In other words, cybernetic technology will be possible because computer technology, surgical techniques, and regenerative medicine will be hybridized into a new field. And it may be coming sooner than you’d think.